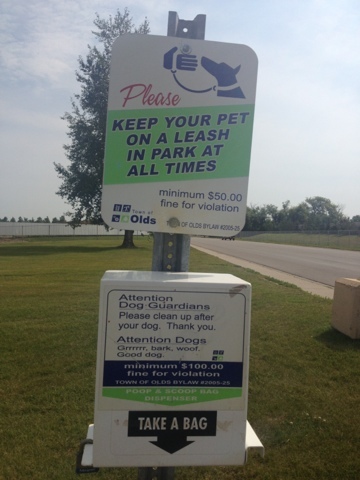 Whenever I take Jessie for a walk, I've noticed a lot of rules around how dogs can use public spaces. Jessie and I go to a lot of parks, and there always seem to be these signs: keep your dog on a leash, clean up after them, etc. At these parks we generally run into are other people with dogs. Rarely, if ever, do we see someone using the park who isn't with a dog . So, who, exactly is pushing for all these signs? Everywhere I go you see these signs. It's pretty clear to me there are a lot of dog haters out there. I'm not going to say that there aren't some poorly trained dogs around. I put a lot of this dog fear down to owners who haven't put in the time to train their dogs. We've put considerable time into working with Jesse on her manners, and she is a very good dog. I can tell you, the vast majority of people we run into at the park have put in the same amount of work, and have lovely dogs. I just wish we could find a balance, where those of us with dogs don't need to face threatening signs everytime we want to use a public space.